Johnny Cash at a record taping in December 1972. Like so many aspiring country music artists, Cash eagerly sought appearances on the Grand Ole Opry, but in 1958, with his recordings selling in the millions, Cash left the Opry for his own grueling schedule of concerts and television appearances. On the road Cash developed a musical style that blended blues, rock, country, and gospel with a persona that was part outlaw, part common man, and part fundamentalist minister. His hard work paid off in one sense–Cash became a major star outside of the finely honed Nashville Sound of the 1960s–but the demands of the road almost killed him, as he became increasingly addicted to various drugs. The years 1967-68 were a second turning point for Cash’s musical journey. He collaborated with Bob Dylan in the latter’s Nashville Skyline album and he released a landmark live album, At Folsom Prison, which captured the musicianship and excitement of his concert performances. More importantly, he married June Carter, a singer with the Carter Family that toured with Cash; kicked the worst of his substance abuse; and renewed his Christian faith. 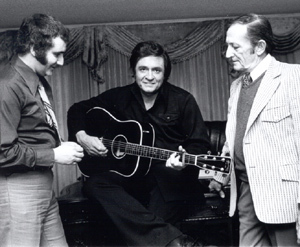 From 1968 to 1971, when ABC ended his network television show taped at the Ryman Auditorium, Cash was the most recognized country music performer in the nation. In the second half of his career, Cash accepted acting roles in television, wrote his autobiography Man in Black (1975), and continued to produce important recordings, from collaborative projects such as Highwayman (1985) and Class of ’55 (1986) to the somber, emotional tones of his latest American Recordings project (1998-2000). He gained a new generation of fans, and became a living legend among many young rockers and country music singers. Of all of the famed artists associated with Sun Records in the mid-1950s, Cash has enjoyed the longest and most musically diverse career. Elected to the Country Music Hall of Fame in 1980, Cash has won or shared seven Grammy Awards and won six Country Music Association awards. He lives in Hendersonville, Tennessee.